CLICK HERE TO TAKE A LOOK AT OUR DOLPHIN VIDEO TAKEN BY OUR PASSENGER HELEN OWEN. 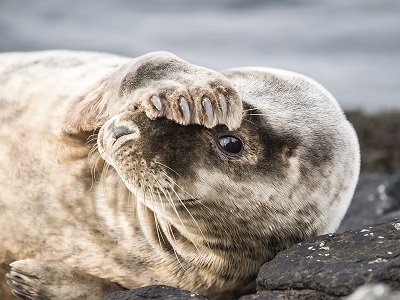 The Atlantic Grey Seal is the rarest species of seal in the world and the colony on the Farne Islands is their only major breeding ground on the east coast. The seals are also the largest surviving carnivores on the British Isles eating a diet of fish which sometimes includes salmon. They breed in the back end of the year, November and December, on the outer group of the islands, most notably Longstone Island. The pups are toffee brown and gain their grey colour six-weeks after birth. The female seals can grow up to 6ft with the males growing anything up to 10ft. Seals are polygamous and males constantly need to fight to defend territory and females from other competing males. The seals are easiest spotted basking on the rocks at low tide and can usually be seen on or around the islands anytime of the year. The Cormorant is the rarer of the two species with only about 150 pairs breeding around Megstone, North Wames and East Wide opens. Their nesting grounds are identifiable covered in limewash, semi-digested fish and featuring a pungent smell. Cormorants lay between two and six eggs in nests constructed from seaweed. Easily recognisable both the Cormorant and Shag stand on rocks and spread their wings to dry them. The Cormorant is larger than the Shag with bronze black plumage, white around the bill and leg during the breeding season. The bird also has a long sharp bill with a hooked tip which it uses for fishing and can catch up to 14lbs of fish per day. The Shag is more numerous with over 400 breeding pairs nesting between Inner Farne, Brownsman and Staple Island. They lay three blue and white eggs in nests perched on rocky ledges, built from local vegetation and seaweed. 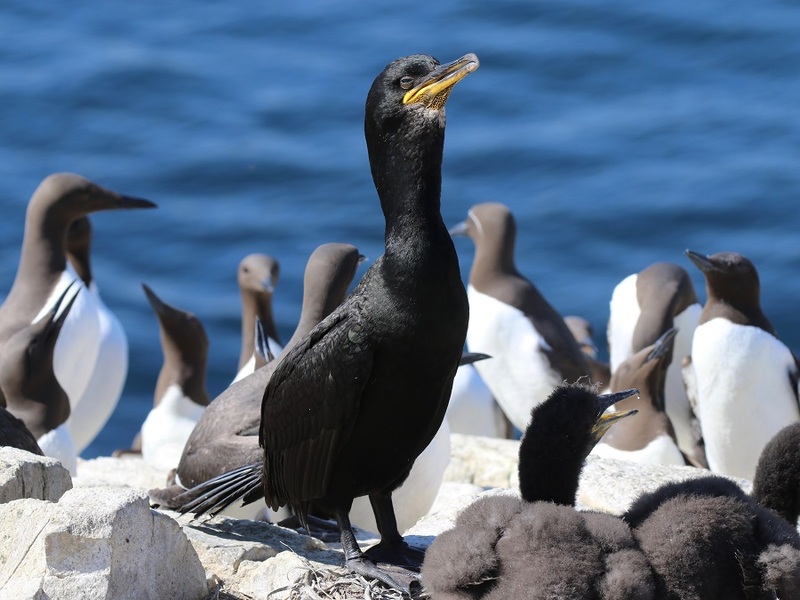 Shags can be distinguished from Cormorants by their smaller size and dark green colour, the Shag also has a yellow patch at the base of its bill and a crest on the top of its head during the breeding season. The puffin is the most numerous of the sea birds nesting around the Farne Islands with close to 20,000 breeding pairs spread amongst Inner Farne, Brownsman, Wideopens and Staple Island. These unique little birds nest in burrows like a rabbit, they dig two chambers several feet down using their bill to loosen the earth and their feet to shovel it away. Stout in stature and with a large head, multi coloured bill and red legs the puffin is the most unmistakable of all the birds around the islands. Their white front and black back give them a dinner jacket like appearance and the movement of their heads while walking give them their local name Tommy Noddy. 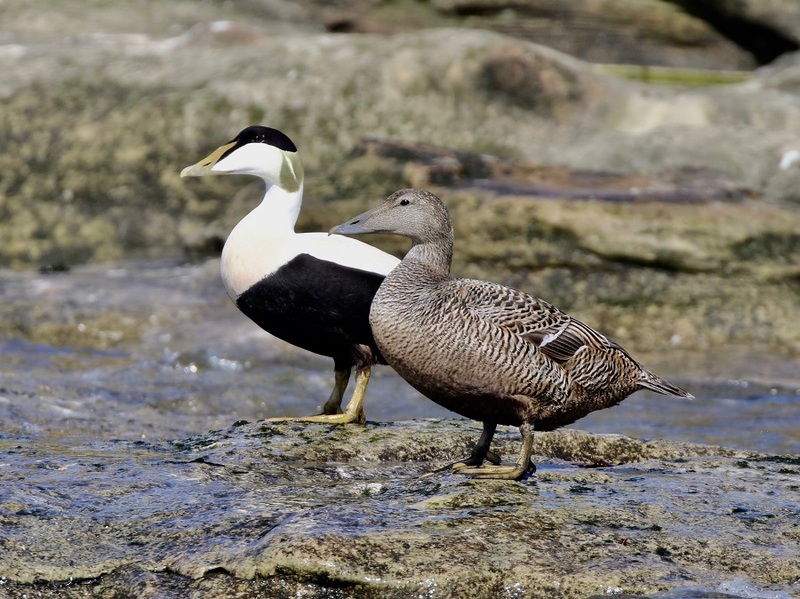 The Eider Duck or "Cuddy Duck" has been a feature at the Farne islands for centuries and was St Cuthbert's favourite duck. The ducks lay between four and six eggs in a nest made from seaweed, grass campion and lined with down. The Farne ducks have been tame for hundreds of years due to constant exposure to people. They can be found on Inner Farne, Brownsman, Longstone and Staple Island. 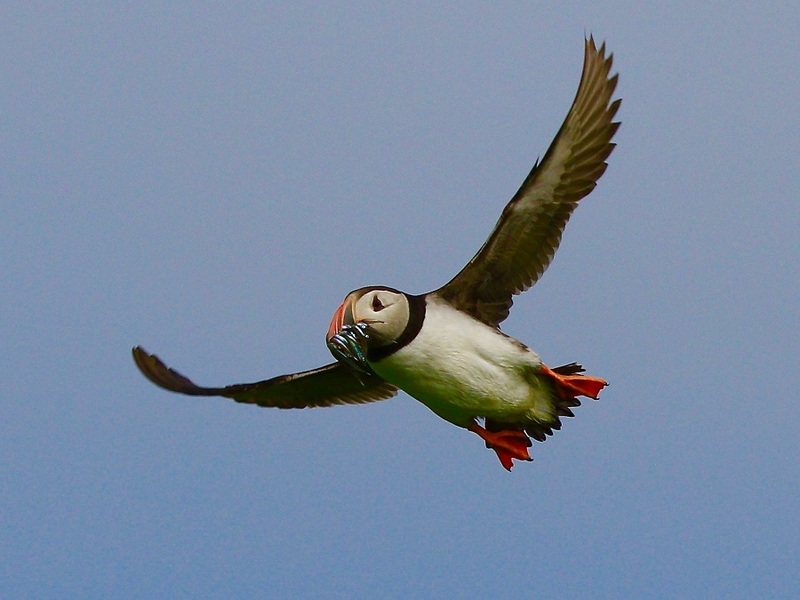 Almost 1000 breeding pairs can be found around the Farne Islands. The ducks themselves are brown with black mottling, while the drakes are white with black under parts and a patch of dark green feathers on the bottom of their head at the top of the neck. In June the drakes moult their white feathers and more closely resemble the ducks. The ducklings are known to be accompanied by males and non-breeding ducks on their first trip out to sea. Similar in appearance to the Guillemot, the Razorbill has a shorter and flatter beak with a white streak running along to its eye. 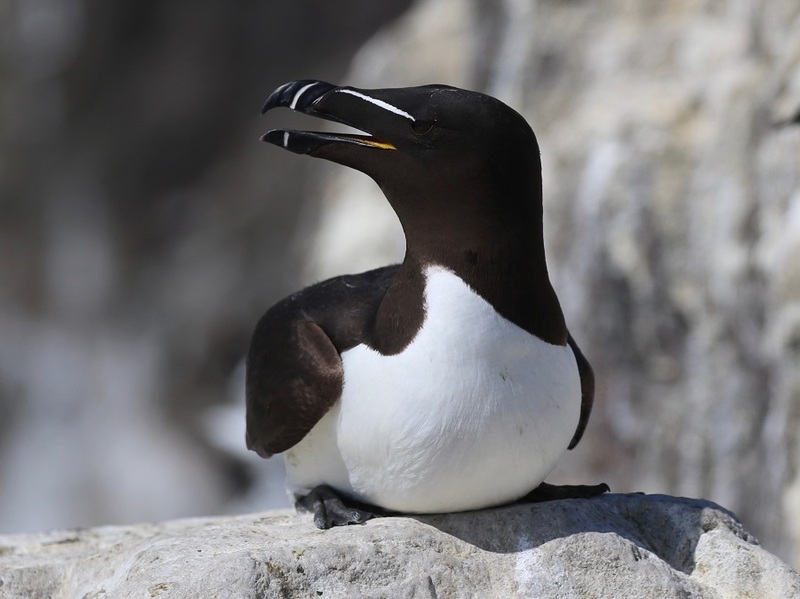 Razorbills are solitary nesters, favouring cliff ledges and rocky crevasse, they lay a single green-blue/brown egg. There are about 150 breeding pars around the Farne islands. The parents tend to their young at the nest site for the first 14 days then coax them down to the sea. Razorbills have been seen pushing their young off cliffs into the water below before accompanying them down and continuing to feed them until they are independent. Like the Guillemot the Razor Bill stands upright in a penguin like stance but can be differentiated from the Guillemot by its blunt shorter bill and its black colouring on its back. The Kittiwake is a type of sea gull and gets its name from its distinctive "Kitti-wa-a-ke" call. These are the most numerous of the sea birds nesting birds around the Farne island, 3000 breeding pairs descend on the Inner Farne, Brownsman and Staple Island during the breeding season. They lay three speckled stone coloured eggs in nests built from campion, grass, seaweed and mud. 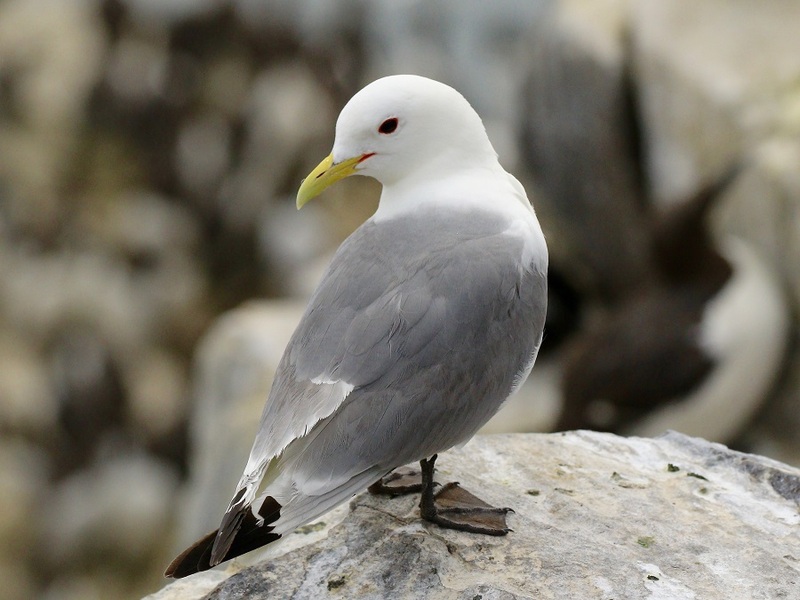 The Kittiwake looks similar to the Herring Gull but can be distinguished by its smaller size, pale yellow bill and dark brown legs. They also have square cut tails and black wing tips. They can migrate as far as North America but return to the Farnes between March and August. Herring Gulls are one of the larger and more predatory sea birds around the Farne Islands. The Herring Gulls nest on most of the islands but most notably Wideopen, Wamses, Big Harcar and Nameless rock. They construct nests from grass and lay three speckled olive green eggs. 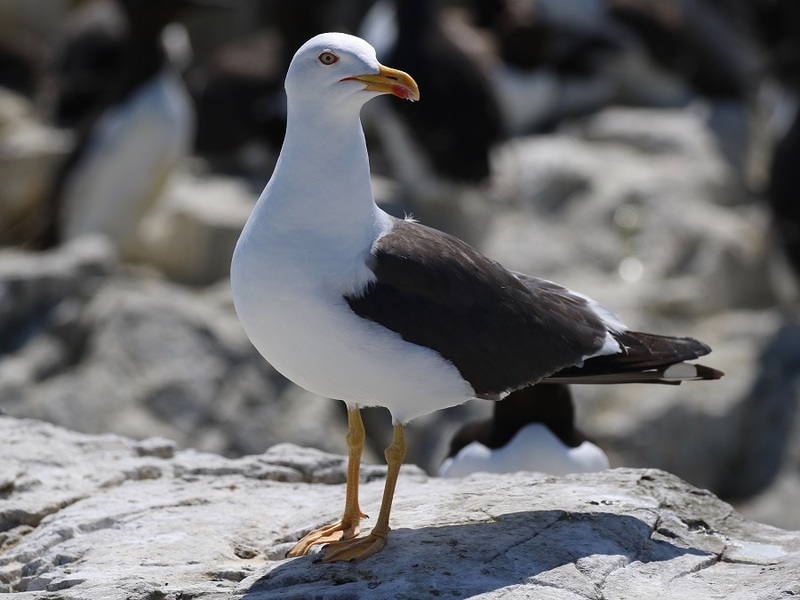 Gulls can commonly be spotted circling like a hawk scavenging for food or the unguarded eggs and chicks of other sea birds. 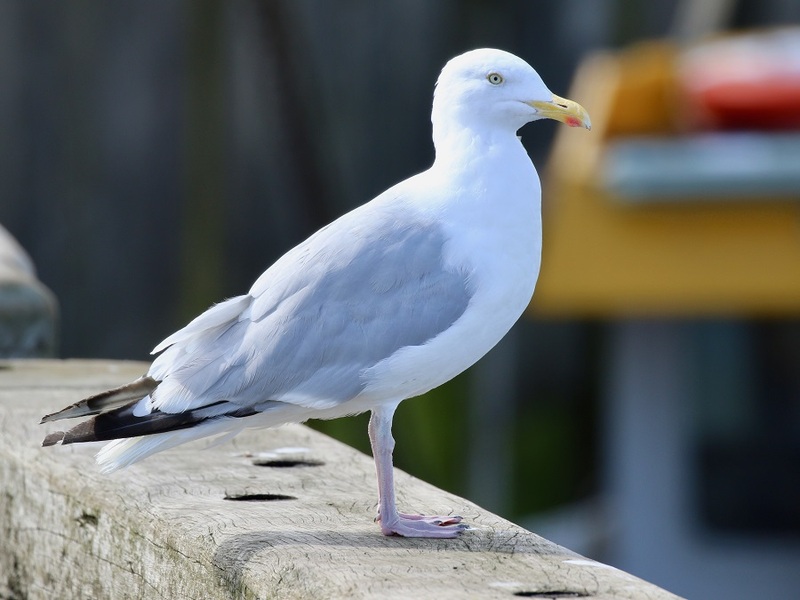 Herring gulls have a pale grey back and wings with a white under part, they have pinkish legs and a yellow bill featuring a red streak on the lower part. Similar in appearance to the Herring gull the Lesser Black-Back is the most predatory of all the sea birds and considered an unwelcome visitor by the National Trust bird wardens. They can be differentiated from the Herring Gull because of their dark grey appearance and bright yellow legs. They have been known to kill puffins and terns and devour other bird?? ?s eggs. In an effort to reduce the population and thus protect the other nesting birds the wardens collect the eggs of Black-Backed and Herring Gulls. Both types of gull pair up before reaching the Farne Islands however the males still fight to secure territory for nest sites. Gulls arrive on the islands earlier than most other sea birds but wardens manage their nest sites to ensure other species are able to nest on the islands. The Farne Islands host around 250 breeding pairs of Black Headed Gulls. These noisy, sociable birds lay three eggs in nests constructed from grass, seaweed and other vegetation. They can be found on Inner Farne, Staple, Brownsman and occasionally on Longstone. Similar in appearance to the other Gulls around the Farne Islands these are distinctive with their black heads, black tipped wings and smaller stature, standing at 15 inches it is one of the smaller Gulls around these islands. Guillemots are most commonly seen on and around the Pinnicles on Staple Island, the Pinnicles are columns of rock just off the main island and the preferred nesting site of these unique birds. The sight of Guillemots crowning the Pinnicles in the breeding season is now world famous, with almost 30,000 birds vying for space on these tiny cliffs, when one lands one must get off. They lay a single spherical, green-blue egg directly on to the bare rock, the shape ensures if its knocked it spins around and doesn?? ?t fall into the sea. 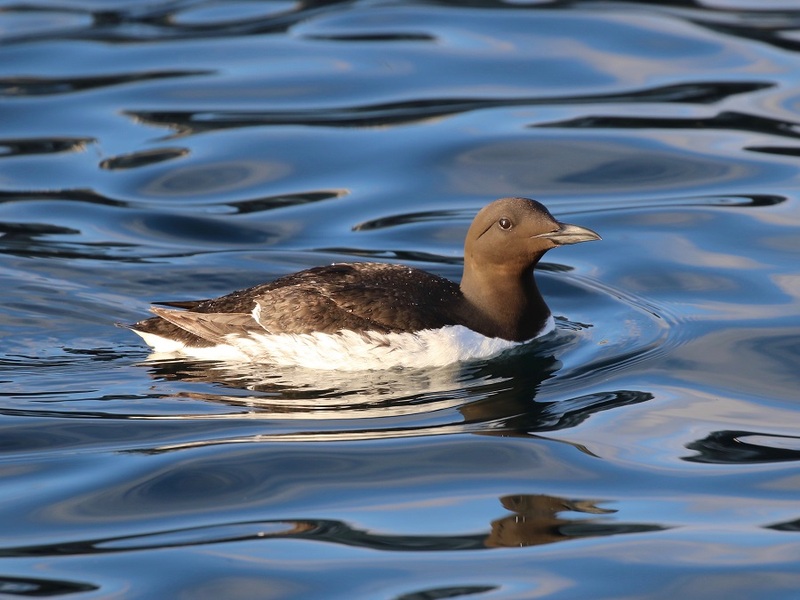 In appearance Guillemots are about 16 inches tall, with dark brown head, neck and back with white under parts. They have a slender, dark bill, and brown legs. After moulting the upper parts change to grey-brown with the throat and cheeks white. The juvenile birds have a similar winter plumage but have a smaller bill. There are four species of Tern nesting around the Fare Islands and all migrate from the southern hemisphere. They nest in large colonies laying a number of eggs varying in colour in a shallow scrape in the ground, commonly between rocks, on sand or under vegetation. All the terns around the islands have grey wings and have a black cap on their head during the breeding season. They are easily recognisable by their buoyant flight, pointed wings and forked tail, resembling a swallow, thus the local name ?? ?Sea Swallow.??? Terns remain on the islands and along the coast line until early September when they start their migration to south of the equator. The largest of the four species around these islands, the Sandwich is 16 inches long with black legs and a long black bill tipped with yellow. 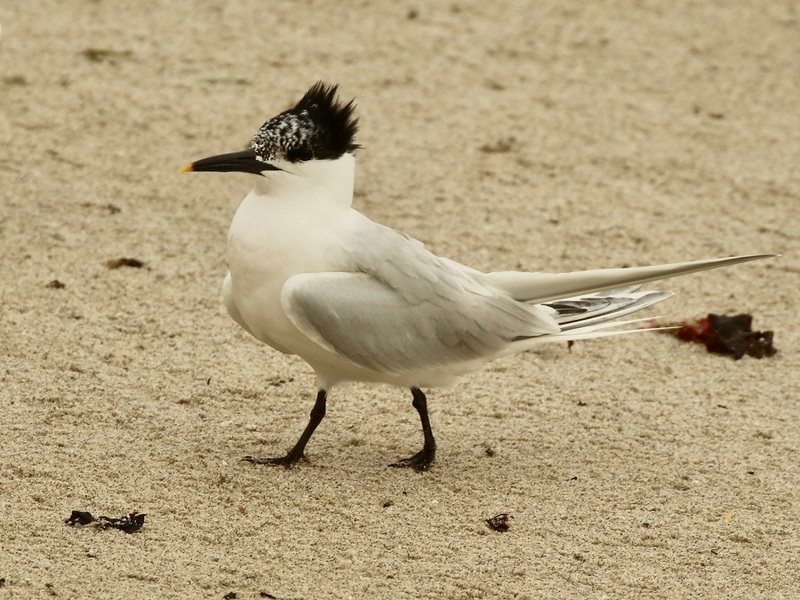 This tern has a shaggy crest at the back of the head during the breeding season however after moulting it loses its black cap and its forehead becomes white. These birds change their breeding location year on year but between 1500-4000 breeding pairs can usually be found on Brownsman or Inner Farne. This Tern is 15 inches long with a blood red bill, red legs, and an aggressive attitude during the breeding season. About 3000 pairs of Arctic Tern nest around the Farne Islands on Brownsman, Inner Farne and sometimes Staple. One of the most impressive sights one can hope to glimpse of these extraordinary birds is when the colony experiences a ???dread.??? The colony ceases its chattering and silence falls before the entire colony take to the sky and out to sea before retuning later to their nest sites. The common tern at 14 inches is the smallest of the four species nesting around this island. They nest in scrapes lined with local vegetation and have tail streamers longer than the Sandwich Tern. The Common Tern has a red bill with a black tip and red legs. 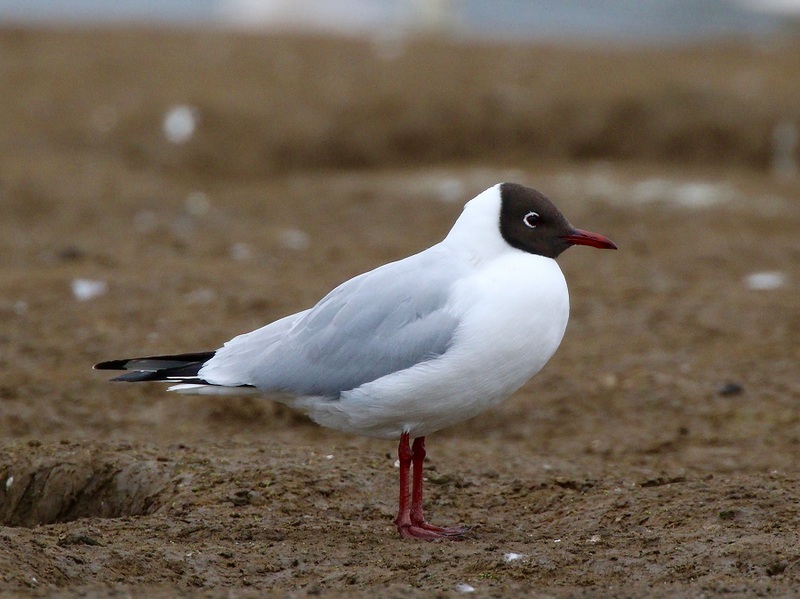 Their winter plumage sees their bill turn a darker colour with red only being left on the lower mandible. 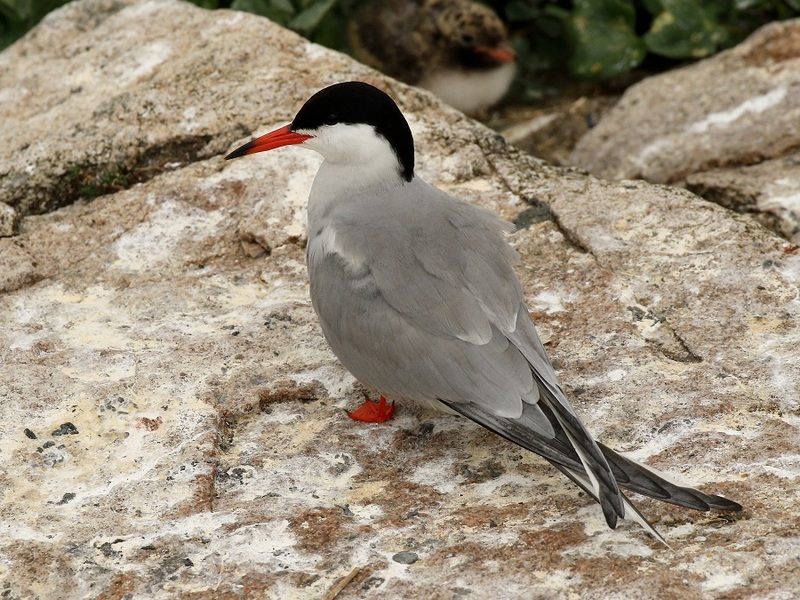 There are only about 200 breeding pairs around the Farne islands and can be found among the Arctic Tern colony. These Terns also arrive at the same time as the Arctic Tern. 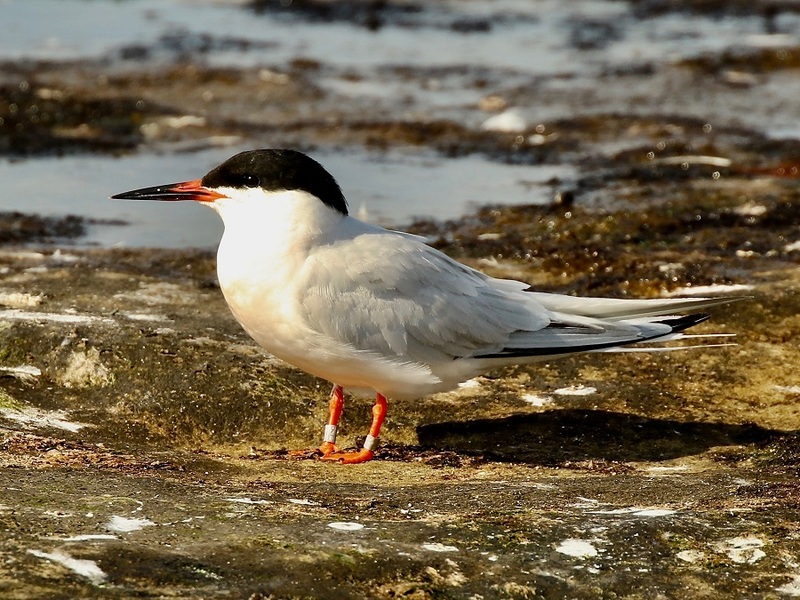 These are the rarest species of tern around the Farne Islands, identifiable because of their black bill with a red base and red legs. They have extremely long tail streamers which extend beyond their folded wing. During the breeding season the plumage of the Roseate features a reddish (Rosey) breast, hence the name. In winter, after it moults, the bird?? ?s plumage loses the red highlight on its bill and gains a white forehead.